Created in Cambodia by Dominique Eluere at the end of the last century, Citadel produces hand crafted knives. Citadel products are hand made by Highly skilled workers. 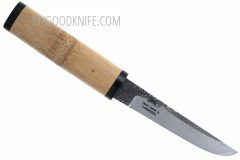 Hight carbon steel blades receive differential quenching that produces visible hamon, and obviously, a long life cutting edge.